By now most people know that the Tesla Roadster is powered by Lithium-ion (Li-ion) batteries. But here are a few things about our batteries you might not have heard. Our battery system – or Energy Storage System, as we like to call it – is comprised of 6,831 individual Li-ion cells. 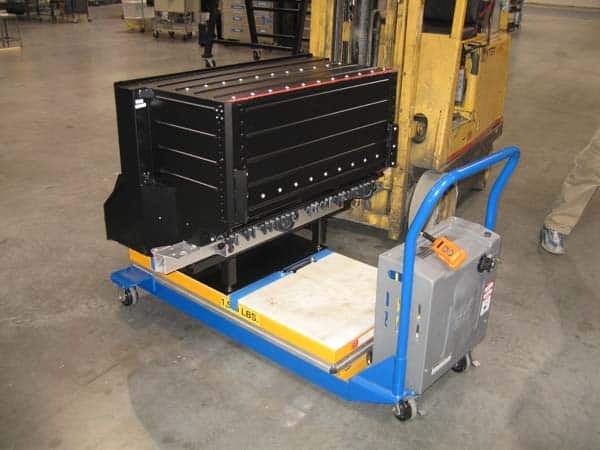 It’s roughly the size of a storage trunk and weighs about 900 pounds. 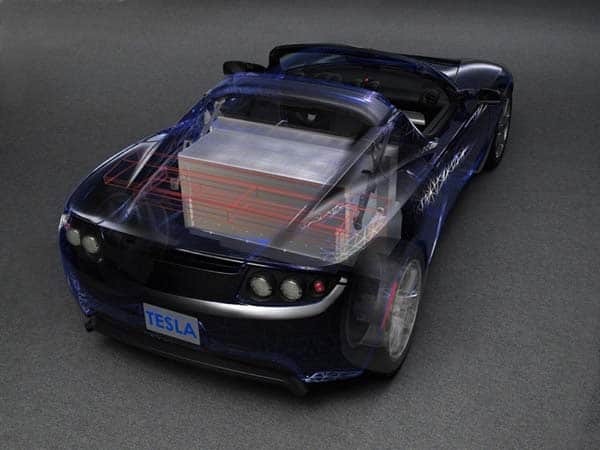 Nestled securely in the back of the Tesla Roadster, the battery system is the secret behind our four seconds 0-60 mph acceleration and phenomenal driving range. To achieve this kind of performance, we were meticulous about our battery technology selection. Batteries are not perfect – no doubt about it. Though market forces continue to drive improvements in batteries, the Li-ion battery system in the Tesla Roadster represents the very best of today’s commercially available battery technology. These Li-ion batteries are a whole lot better than Nickel-Metal Hydride (NiMH) cells and lead-acid cells found in EVs of yore, but they too have their limitations. One of the most difficult challenges in battery design is increasing energy density while also maximizing battery lifespan. Li-ion chemistries have achieved better combinations of these parameters than anything that has come before. Yet there is still a tradeoff between energy and life, even within the family of Li-ion. The bottom line is that all batteries age and they lose capacity as they do. This, in turn, shortens driving range. Batteries age with use and they age with time, even if not used. We tend to look at two kinds of aging: aging from use, called “cycle life,” and aging with time, known as “calendar life.” These two different aging mechanisms can be thought of as separate, overlapping forces. In reality, they are always operating together and depending on the type of application and usage pattern one may become more important than the other. Another consideration is that environmental conditions such as temperature and humidity affect each aging mechanism in its own way. And, of course, various kinds of batteries age very differently in terms of cycle life and calendar life. Through the process of developing the Tesla Roadster and in previous ventures, we have really become experts in battery technology, particularly Li-ion. This week, we’ll share with you what we have learned about battery technology and what you should expect from the Li-ion-powered Tesla Roadster. Avoiding very high charge rates. Charging faster than about C/2 (two-hour charge) can reduce the cell’s life. We were all trained by annoying nickel-cadmium (NiCad) batteries (the older batteries that used to be popular in cell phone and laptop computers) to fully discharge them before recharging again. These batteries suffered quick capacity degradation – the so-called memory effect – if you didn’t do this. The good news is that Li-ion cells do not have the same problem. There is a huge difference in cycle life between a 4.2V/cell charge (defined by the manufacturers as “fully charged”) and a 4.15V/cell charge. 4.15 volts represents a charge of about 95 percent. For this reduction of initial capacity (5 percent), the batteries last a whole lot longer. Unfortunately, further reduction of charge has a much smaller benefit on cycle life. Understanding this tradeoff, Tesla Motors has decided to limit the maximum charge of its cells to 4.15 volts, taking an initial 5 percent range hit to maximize the lifetime of the pack. We also limit the discharge of our battery pack to 3.0V/cell and will shut down the car when the batteries reach this level. Limiting our charge rate is less of a compromise since the wire size and availability of very high current outlets limit us much more than the batteries do at this point. Calendar Life Li-ion cells lose capacity with time, even if they are just sitting on a shelf. They lose the earliest in their life (year one) and then continue to lose capacity gradually thereafter. Two factors shorten calendar life considerably: lifetime average temperature and time spent at high states of charge. Batteries would last the longest if they were stored in a refrigerator at a very low state of charge. They age the fastest when stored in a hot place at a full state of charge – like those in your laptop computer, plugged into its charger and being cooked by a toasty Pentium processor. At Tesla Motors one of our key inventions to maximize battery life is a sophisticated liquid cooling system that maintains a favorable temperature for the batteries, even under extreme ambient conditions. Our cooling system engages to try and keep the temperature of the cells below 35° C at all times and the lifetime average temperature at or below 25° C.
The other significant factor that affects calendar aging is the charge state of the battery during storage. At higher charge states cells lose capacity faster. This is a second reason why we have limited our maximum state of charge to 4.15V/cell instead of 4.2V/cell. We also offer the driver the option of charging to only 3.8V/cell (~50 percent) or 4.10V/cell (~90 percent) to further extend calendar life if the full vehicle range is not needed on the next few trips. We advise and encourage a full (4.15V/cell) charge only when it is needed. So what does this all mean for the real-world performance of a car? As batteries in any EV age, they lose capacity and the vehicle will lose range. This is unavoidable and true in any EV with any type of battery. You can think of this as a very slow reduction in the volume of your vehicle’s “gas tank” over its lifetime. We limit how fast this aging and loss of range happens by working very hard to select the best cells, design the best cooling systems, and carefully manage charge states. By doing all of this we expect more than 100,000 miles of driving range and more than five years of useful life. However, at the end of this period, the pack will have less capacity than when new (just like an internal combustion engine has less power and much worse emissions than when new). If, for example, you drive 10,000 miles per year at the end of five years you will have around 70 percent of the energy storage capacity of when new. This performance gives the Tesla Roadster battery pack the best range and lifetime combination of any production EV battery ever built. Consider that even after five years and an aggressive 100,000 miles of driving, the Tesla Roadster pack will have more energy storage available than the Gen2 EV1 (with its high-capacity NiMH cells) had when it was NEW!